Annie Lebeaux plays the final calliope departure concert. The deck crew let loose her lines and the Delta Queen sounded her whistle. She made her final departure from Oak Alley Plantation and rounded gracefully downstream. Annie Lebeaux played a wonderful concert on the calliope as there were many out on the decks of the American Queen to watch the Delta Queen head downstream into history. Captain Gabe Chengery, Laura, and I stood along the rail and watched the American Queen until we rounded the bend. Captain Gabe went to visit in the Pilot House and Laura and I turned to a few final tasks packing things away. For much of the ride down to New Orleans, we kept ourselves busy to distract from the flood of emotions lurking just beneath the surface. Finally, we gave in and sat out on one of the swings on the bow forward of the Forward Cabin Lounge and watched the final few miles creep by. Rounding into the harbor we gathered once again with Captain Gabe at at the calliope as the Delta Queen made her entry into New Orleans harbor. Captain Gabe played a terrific concert filled with a greatest-hits of good old river tunes. He closed out with “Abba Dabba Honeymoon” which is a special song that Captain Doc Hawley used to play for him aboard the Avalon when Gabe was just a youngster. Gabe said he wanted that to be his final song on the Delta Queen. He then returned to the pilot house and graciously turned the keyboard over to me to bring her on in. Captain Dugger had asked us to cut off at the bridge, so I played a few of my favorites. The last song played on the Delta Queen calliope was “When the Saints Go Marching In.” I wanted to close with that because I read in Letha Greene’s book that was the last song played as the boat departed Cincinnati back in 1970 when they thought it might be all over for the Delta Queen. Jane Greene told me it was also one of her dad’s (Captain Tom Greene) favorites. The song also is a New Orleans favorite, so I thought it very appropriate. I held the last chord as the echo resounded off of the bridge, and I swear to you, I had trouble pulling my hands off the keys. I just couldn’t let go. Emotionally, I’m not sure I will ever be able to. Playing the calliope that day, working aboard the boat, meeting so many incredible guests and crew members, have all been some of the greatest honors of my life. The boat dipped down near Algier’s Point and rounded back upstream to dock quietly alongside the Riverwalk Mall. A few shoppers and diners in the food court stepped outside onto the mall’s balcony to watch. I wondered if they had any comprehension what a tremendous historical moment they were watching. Quite possibly the end of the Steamboat Era. I wished for a massive microphone and speakers to announce to all of New Orleans the sigificance of this moment. I wanted them to share in my utter and absolute deperation and dismay. I wanted them to cherish this boat and its history as much as I do. But they quietly turned and went back to their sandwiches and shopping. I thought my heart would burst. Once docked, Laura and I distracted ourselves by slipping down to the crew mess for a quick bite of dinner before the busy evening of receptions, tours, media, and ceremonies would begin. The crew mess, usually boisterous, was solemn and silent. The few of us eating did so quickly and quietly. I wondered if the boat understood her days were ending. I have seldom felt such deep and profound sadness. We held hands, savoring the beauty of the day and the scene. We went all the way back to the gift shop to enjoy a slice of the best pecan pie I’ve ever enjoyed. Oak Alley also offers another best – the best mint juleps – and one was a necessity this morning for us to share and sip on. Here’s my video version of a stroll around the grounds. 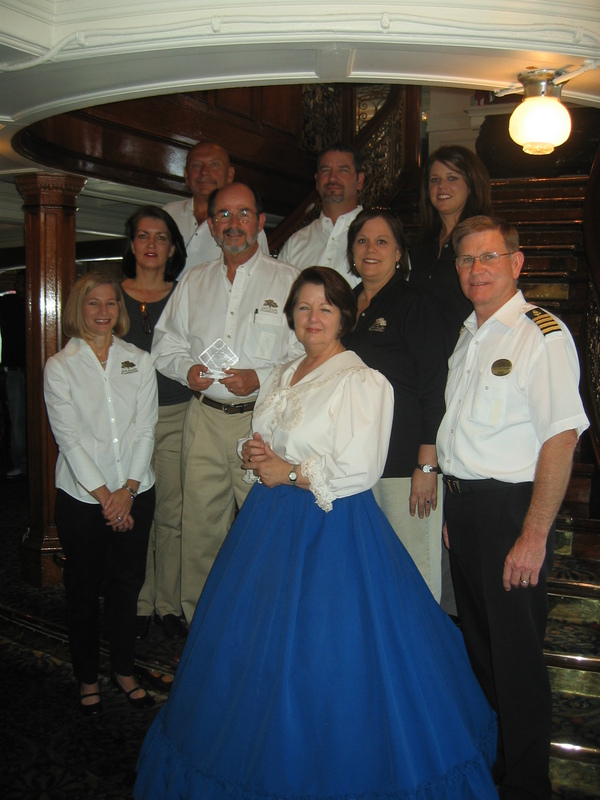 We enjoyed having Zeb Mayhew and his staff from the Oak Alley Foundation come aboard the Delta Queen for a tour and visit with the Captain. Just following their departure, we prepared for the Delta Queen’s final departure to head on down to New Orleans.